And... it's Friday. Bump. End of the little holiday, beginning of the not-so-slowly filling schedule. Wanh! I want to stop that happening but the truth is I can't justify more lazy time - I'm feeling much better and much less sleepy. Even the cough is wandering off to find something else to do. Proof I am mending: yesterday when I was pouring some tea to help chase it there was a huge THUNK at the door and I knew a Very Important Parcel had arrived. Much of the rest of the day was spent washing and drying and ironing what was inside and not even thinking about being tired or needing to sit down. 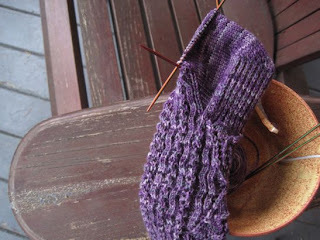 Of course sandwiching all that, I worked on the lace socks. I decided to go on with the front lace panel on the foot, as written - it takes longer, and because I need a cable hook to do it, it doesn't feel portable at all... but it's so pretty. And, annoyingly, when I tried the longer of the two socks on last night I found it fits really well - it hugs flatteringly without being at all tight. And now it's time to get on with this last day of my holiday. 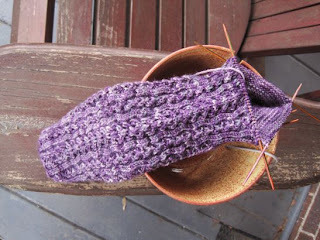 Shall I knit some more, or get a start on this year's taxes? Ugh. Maybe a little of both. Sometimes I think that's the most important function of knitting - balancing out the yuck. Have a lovely weekend my friends, all out of balance with minimal yuck and maximum making!